this product works!!! my VO2 max is 63% now that I have been taking this product for over two years!!!!!!! Optygen HP iand Ultragen are the BEST!! 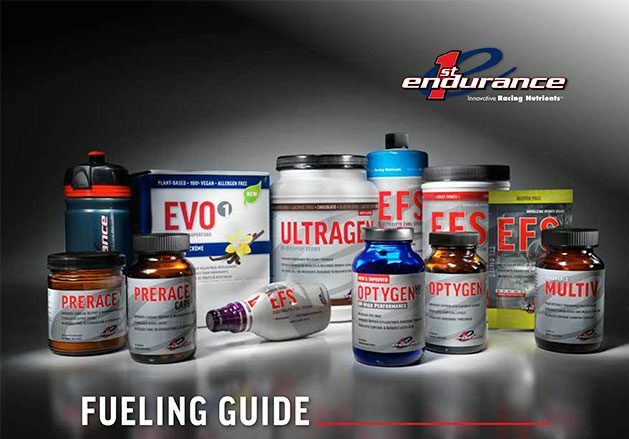 I love these products - and actually all the First Endurance products. I have been a firm believer in their products for 15 years. They have hit the nail on the head with recovery and fueling properly on the bike so that your recovery time decreases and you feel better in the races. With Optygen HP your performance accelerates but you don't realize what is doing it until you stop taking it. Then everything just seems a bit harder. It seems the older you get the more effective as well. Ultragen has always been my go to for recovery. I can push myself really hard one day and then am usually dead the next. Ultragen has always been the recovery that makes it so I can keep on training. It has the best mix of ingredients than any other product I have found. The newer on the bike EFS and EFS pro are right in line with the performance of Ultragen and Optygen HP. Great products!! I started taking Optygen HP 3 years ago to supplement my endurance mountain bike racing and training. Even though most of the effort in this type of racing is below anaerobic, even threshold, it is an advantage to boost all the systems. While the goal may be to ride in a zone that isn't using too much glycogen the nature of mountain biking over harsh terrain dictates the effort- and I find myself punching well above threshold very often. I notice an increased ability to recover from these efforts and the ability to process fuel in a way that helps me have plenty of energy left during hours 4-9 of a long race where other people tend to fade significantly. I have used First Endurance products for more than a decade. Every year when I begin loading Optygen HP for the upcoming race season I seem to notice that I drop a few extra pounds. Whether it is coincidence or not, I notice the effect every time I cycle on and off of Optygen HP. Three weeks ago I weighed in at at 164, I began loading on March 1, now I am at 161. The new and improved OPTYGENHP has been engineered to optimize performance for endurance athletes and is the best OPTYGEN formula we’ve ever developed. This next-generation OPTYGENHP has been upgraded with the most potent blend of Cordyceps mushroom available to maximize your VO2max and time to exhaustion. In addition, there’s a clinically effective dose of premium grade Rhodiola because the latest clinical research shows the combination of these two endurance-specific adaptogens improves aerobic performance. The main adaptogen in OptygenHP were first used by Tibetian Sherpas to help them climb Mt. Everest. OptygenHP contains this unique adaptogen because clinical research on elite endurance athletes shows it increases VO2Max, increase the body’s ability to adapt to high levels of physical stress, increase anaerobic threshold and reduce lactic acid. 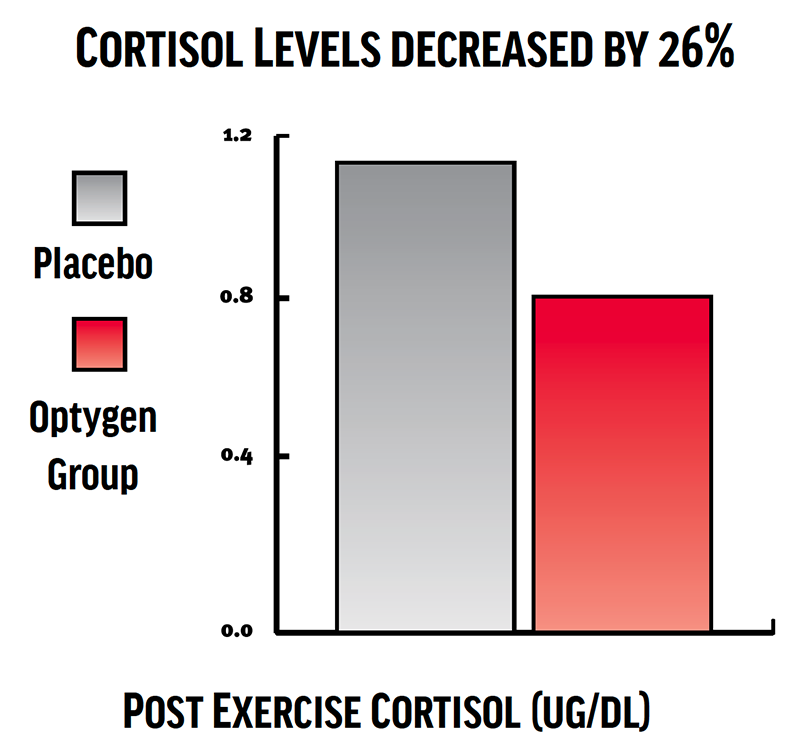 A study done by South Dakota State University showed OptygenHP reduces cortisol levels (the primary stress hormone) by 26%. Chronically elevated cortisol levels can prevent an athlete from recovering, increase the risks of overtraining and suppress the immune system. A 2012 study done at Luther College showed endurance athletes who used OptygenHP increased time to lactate threshold by 42%. The purpose of this study was to determine the effects on highly trained distance runners of OptygenHP. 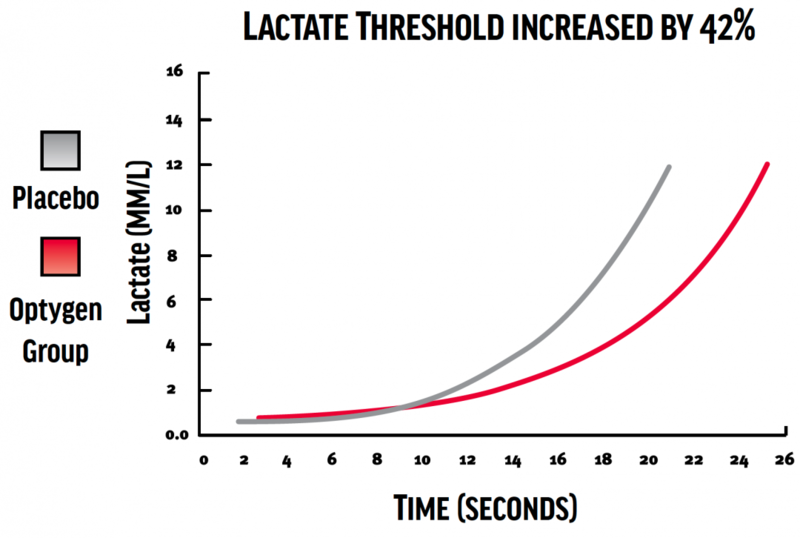 Though changes in performance variables (VO2 max, hemoglobin, serum ferritin and salivary cortisol) were similar between groups, time to onset of lactate threshold was nearly 42% greater in E=experimental vs C=control group. The first part of the OPTYGEN-HP formula utilizes chromium for its ability to break down fuel. Chromium is an essential trace mineral that aids in glucose metabolism, regulation of insulin levels, and maintenance of healthy blood levels of cholesterol and other lipids. Chromium forms part of a compound in the body known as glucose tolerance factor (GTF), which is involved in regulating the actions of insulin in maintaining blood sugar levels and, possibly, in helping to control appetite. It is critical that any drink, bar or pre-race meal consumed prior to a race or exercise gets broken down efficiently in order to maximize fuel delivery. Insulin spikes or lack of insulin response can cause the nutrients to either be rushed into the bloodstream too quickly or not quickly enough. Chromium regulates this nutrient breakdown so equal and sustained nutrients are delivered to the working muscles. The most widely available sources are chromium salts such as chromium polynicotinate and chromium picolinate. OPTYGEN-HP uses chromium chelate, a unique form of chromium patented for its superior absorption and bioavailability properties compared to other sources. The second part of the OPTYGEN-HP formula uses adaptogenic herbs to improve oxygen efficiency. Originally, these two adaptogenic herbs were gathered by Tibetan Sherpas for use in their tea. The Sherpas used these herbs to give them energy to climb Everest, which they did without the use of supplemental oxygen. One of the adaptogenic applications of Rhodiola that has received considerable research attention recently is in adaptation to high altitude – a preventive treatment for hypoxia, or mountain sickness. In June 2002, Dr. Rulin Xiu was awarded a patent for her work showing Rhodiola’s ability to oxygenate blood. Clinical studies on Cordyceps have proven its ability to increase endurance through more efficient enzyme activity, mobilization of free fatty acids and beta-oxidation. In a 1998 study, Dr. Edmond Burke observed that Cordyceps has the ability to improve lactate energy metabolism within the cell. All these mechanisms clearly show how these two adaptogenic herbs improve the efficiency of oxygen transfer in the cell leading to improvements in oxygen uptake and VO2max. The third part of the OPTYGEN-HP formula uses Beta-alanine to efficiently synthesize lactate to be re-used as fuel. Beta-alanine is a non-essential beta-amino acid. L-carnosine enters the digestive system and is hydrolyzed into histidine and beta-alanine, which is then synthesized back into carnosine by skeletal muscle. It is with intense training that athletes improve their muscle carnosine content by up to 87% (Harris, 2005). With intense training, carnosine levels can be increased, but with a limiting factor: the body cannot produce enough beta-alanine to allow the body to continue to increase carnosine levels. Clinical studies show that supplementing with beta-alanine allows the body to produce significantly higher carnosine levels. Through its effect on carnosine levels, beta-alanine synthesizes lactic acid to be re-used as fuel. The result is a highly effective mechanism for the metabolism of lactate, which in turn improves endurance capacity allowing training and racing at a higher level. The final step of the OPTYGEN-HP formulation puts all the necessary components together to ensure efficient Adenosine Triphosphate (ATP) production. Clinical research has shown that endurance athletes diminish their ATP stores in exhaustive exercise, which can lead to a reduction in aerobic metabolism and endurance. OPTYGEN-HP’s proprietary ATPro™ matrix of five key nutrients is designed to ensure ATP production. Since ATP is the final step in aerobic energy production, it is critical that the nutrients feeding the ATP cycle are readily available. Calcium pyruvate, sodium phosphate, potassium phosphate, adenosine and d-ribose all play critical roles in glycolysis and the citric acid cycle, leading to efficient ATP production. An endurance athlete’s VO2max is directly proportional to the body’s ability to efficiently produce ATP. Q: How is this new OPTYGENHP formula different than the previous formula? This is the most-powerful OPTYGENHP forumula available. This new formula contains two strains of Cordyceps: Cordyceps Militaris and Cordyceps Sinensis. This new formula no longer contains the Eleuthro extract blend. This formula is now 100% VEGAN & ALL NATURAL. We have removed the color and it’s no longer in a bovine capsule. Q: How do I use this new formula? A: For best results, use this new OPTYGEN-HP formula during all intense training. This formula will allow you to train at a higher level by improving the body’s ability to adapt to physical stress, increasing aerobic threshold and reducing lactic acid. These improvements will help you race at a higher level. For best results, OPTYGENHP should be used consistently for many months leading up to competitive events. If you start taking it a week before a race, benefits will be minimal. Q: Will I notice anything different vs the previous OptygenHP formula? Q: Why does OPTYGENHP contain adaptagens? A: The OPTYGENHP formula utilizes two adaptagens that are the primary ingredients in the formulation. Patented Rhodiola Rosea and Cordyceps are both found and cultivated in Tibet. Both these herbs play critical roles in allowing the body to adapt to high levels of physical stress (similar to the stress a body is subject to when climbing Everest). It’s these adaptations to hypoxia (lack of oxygen) which led researchers to also test its effects on elite athletes. Both Rhodiola and Cordyceps have been clinically shown to increase VO2Max, lung function, oxygen utilization and anaerobic threshold significantly. Q: Why does this formula contain Beta-Alanine? A: A number of clinical studies have been conducted to evaluate the effects of beta-alanine supplementation on VO2max, time to exhaustion and lactate concentrations. Subjects supplemented with beta-alanine for six weeks. The group experienced a significant increase in VO2max, an improvement in time to exhaustion and lactate utilization.